Have a close-up look at DNA; you’ll see it wiggles in the oddest way. Put more scientifically, a piece of DNA’s movements are often counterintuitive to those of objects in our everyday grasp. Take a rod of rubber, for example. Bend it until its ends meet, and you can count on the elastic tension to snap it back straight when you let go, said biological physicist Harold Kim. “That doesn’t always work that way with a piece of DNA. When you bend it into a loop, the elastic energy more often than not wants to bend the chain further in instead of pushing it back out,” said Kim, an associate professor at the Georgia Institute of Technology. At the School of Physics, Kim is fine-tuning the observation of how biopolymers behave, in particular DNA at short lengths. He published his latest results on “Force distribution in a semiflexible loop” in the journal Physical Review E on April 18, 2016. The research is funded by National Institutes of Health. Georgia Tech’s James T. Waters coauthored the research paper. In complex simulations, Kim studied the motions of DNA chains at lengths where they still have springy qualities, in order to understand their mechanochemical properties, or how they work as microscopic objects. In particular, he has illuminated the forces acting upon DNA bound up in short loops. That’s a common and important shape that keeps DNA from expressing when it shouldn’t and then possibly messing up cell functioning. Kim’s most significant counterintuitive find could improve understanding of how DNA snaps free from the proteins that bind them into those loops. He has observed that looped DNA, though on average very gentle in its motions, is beset by moments of unusually high force. “It would be a little like a chaotic spring drawn up to a loop making pretty even jumbly movements then suddenly whipping out violently,” Kim said. The range of observed forces on DNA loops breaks the bounds of what thermodynamics predicts. Even though the mean of the force distribution does indeed equal the thermodynamic force, the distribution of forces pushes past the anticipated norm, falling broadly outside a Gaussian distribution on both ends. 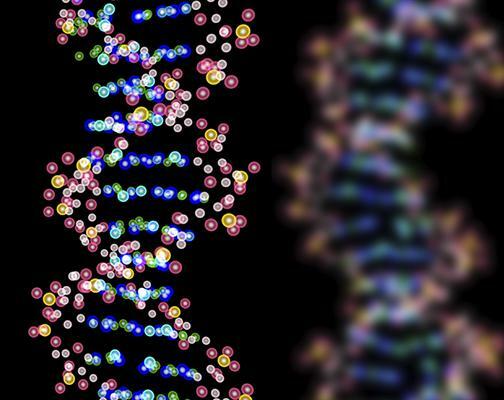 It could help scientists in various disciplines predict the lifespans of many DNA loops and understand the frequency and likelihood of their undoing. The forces contributing to those momentary jerks and snaps work on the whole contrary to one another. While that elastic energy works on DNA pieces in its ways, the forces of entropy push hard in their own ways. Reflective of the universe overall, in Kim’s observations of springy DNA loops, entropy, here too, wins. Entropic forces slightly outdo the elastic forces. And they, too, defy intuition. To understand how, let’s take a look back at that rubber bar. When a short DNA chain is not looped but only bent, it acts more like the rubber bar. The elastic force dominates and mostly wants to push it back straight, while entropy mostly wants to keep it curvy. Then, as the DNA chain lengthens a bit and loops: That relation starkly turns on its head. The elastic force then pulls inward with vehemence, and the entropic force then pushes the chain outward with even more vigor. The length of a DNA loop appears to contribute strongly to how likely these intermittent extreme forces are to destabilize its bond with the protein holding it shut. That, incidentally, plays right into many scientists’ current discussions on other biopolymers. “There’s a lot of speculation right now that the kinds of force-peaks we observed actually regulate the length of some biopolymers, so, in an interesting way, our observations and methods may help colleagues explore this idea more closely,” Kim said. Kim’s group augmented thermodynamic calculations with a novel simulation method, “phase-space sampling.” It not only establishes the positon of molecular components in space but also their momentum at a given time. This way, Kim was better able to access the fluctuating forces on looped DNA chains – and see more closely how they really wriggle. The work is funded by the National Institutes of Health, grant number R01GM112882. Any conclusions or opinions are those of the authors and do not necessarily represent the official views of the NIH.